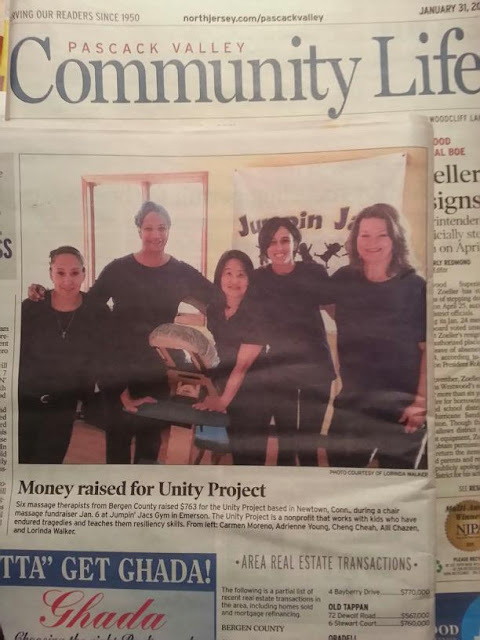 In this week’s Community Life section of The Record was the following inspiring article about massage therapists (one of whom is my close friend Allison Chazen!) who raised $763 for the Unity Project in Newtown! I’m glad to see that people are taking initiative to help those facing the December tragedy and using all their efforts and talents to do so! In times of crises we all need to help one another out lending a helping hand (or massage!) when needed. Thank you for all your hard work Carmen Moreno, Adrienne Young, Cheng Cheah, Alli Chazen, and Lorinda Walker!